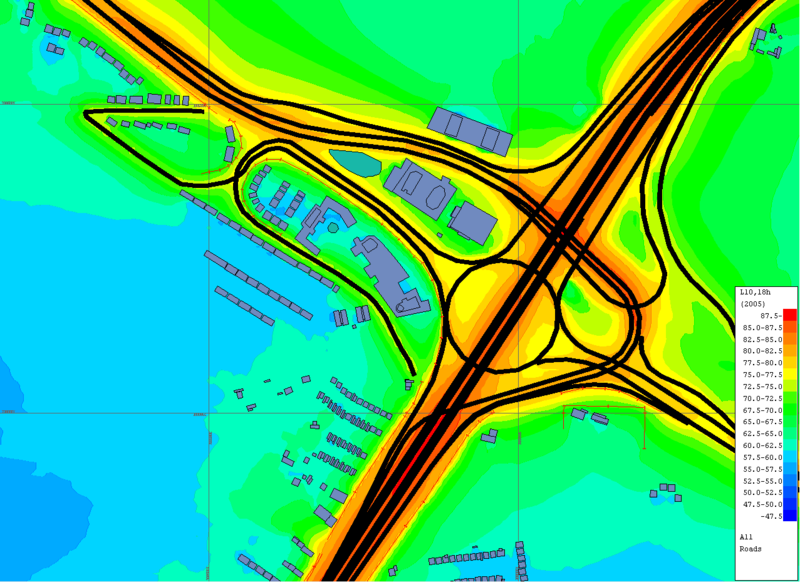 NoiseMap models and calculates road traffic noise using a method called ‘Calculation of Road Traffic Noise’ (CRTN). It was originally published in 1975 and was updated in 1988. Further refinements have been devised since then and these have also been incorporated into NoiseMap. CRTN calculates noise levels in terms of the LA10 index. This index has been largely superseded by the Equivalent Continuous Sound Level (LAeq). Fortunately, at locations alongside roads, these two indexes are highly correlated, which means that it is possible to predict the LAeq level from the LA10 level with a high level of certainty. The UK government has published a procedure that allows LA10 (18-hour) levels to be converted into Lden and Lnight values. Because motorways carry a higher proportion of traffic at night compared with other roads, the conversion factors for motorways are different from the conversion factors for other roads. NoiseMap also lets you calculate the noise levels for each hour of the day and to combine these to obtain averages over various time periods. This is particularly useful for ‘managed motorways’ where lane control is used to maximise the efficiency of the road, thus meaning that flows may deviate from the typical daily pattern. Calculation of Road Traffic noise involves several steps. Divide the road network into as many segments as necessary to ensure that there is uniform traffic and propagation conditions for each segment. In a large city, this could mean tens of thousands of road segments. The calculation method is then applied to each of these segments. Calculate the noise generated by the traffic on a segment at a notional reference location which is 10 m from the edge of the nearside carriageway and at a height of 1.2 m above it. This is the Basic Noise Level. the effect of reflecting surfaces. The calculation of the effect of barriers is particularly complex, as there can be many barriers between the road and the receiver, particularly in a city with many buildings. The contribution from each segment is also adjusted according to the angle of view that it subtends at the receiver. The contribution from all the road segments is then added to obtain the total noise level at the receiver. This procedure gives the LA10 value, which can then be converted to Lday, Levening, Lnight or Lden values using procedures published by the Government.